On January 10, 2017, a team of SP’s Land Forces comprising Jayant Baranwal, Editor-in-Chief, SP’s Land Forces, and Lt General V.K. 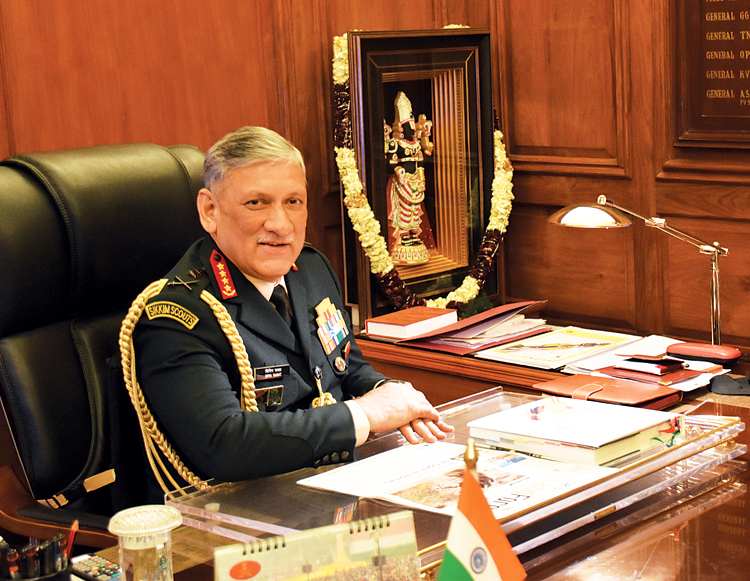 Kapoor (Retd), interviewed General Bipin Rawat, Chief of the Army Staff who candidly spoke about the army’s responses to the challenges being faced, and the ongoing modernisation of the Indian Army. Excerpts from the interview. Guide Publications (SP’s): China’s economic rise, its steadfast military modernisation, its aggressive actions in the disputed border areas and their nexus with Pakistan has some cogent lessons for India. Modernisation of the Indian Armed Forces and capability building cannot be ignored any longer. As the COAS you have in many forums clarified the type of threats and challenges we are facing, yet our modernisation does not seem to be picking up pace. 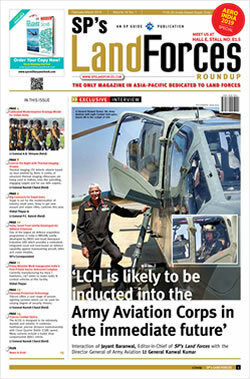 What are your thrust areas and how far have we progressed in the Army? What is holding us back? Chief of the Army Staff (COAS): We, as yet do not have a well defined border in our Northern Sector, in Jammu & Kashmir and in the Sir Creek area. Our effort has remained focussed along the Western Front, whilst the Northern Sector did not get the attention it deserved. Our modernisation effort is now directed at ensuring improvement of our surveillance capability, capacity building and empowerment of forces in the North which is infantry centric, with scope for employment of mechanised forces in selected sectors. Development of infrastructure to enable application of forces in priority areas are being given due impetus. Capability and capacity enhancement in Rann of Kutch is being addressed simultaneously. With this as the back drop, we have prioritised our future requirements, looking at newer generation of weapons and systems and carrying out upgrades in some of the existing ones, so as to ensure judicious utilisation of funds at our disposal. We cannot remain dependent on import of weapons, equipment and ammunition. Accordingly, we are maximising our effort at indigenisation through the ‘Make in India’ initiative. We are willing to support the industry through a process of ‘hand shaking’ and where necessary, revisit GSQRs. Indigenous manufacture of important ammunition has also been approved by MoD and we look forward to the industry grabbing such emerging opportunities at indigenisation. DPP-2016 has further contributed towards streamlining the procurement process and is a good enabler. Hiccups if any in DPP-2016 are being reviewed, so as to reduce timelines and procedures for procurement. In addition, the Government has delegated enhanced powers to VCOAS for procurement of critical ammunition & spares. In the current 13th Plan, since April this year, we have concluded contracts ranging from Self Propelled Guns, Artillery of higher calibre, MRSAM, ALH with its ammunition, Digicora, Mines and Mine Detectors, Electronic Fuzes & TI sights which are aligned to the key thrust areas. Assault rifles for Infantry and improvement in surveillance resources are being progressed on higher priority. Improvement in our technological threshold by coordination of effort with IITs and industry have been given impetus. Establishment of Army Design Bureau (ADB) is also a step in this direction. Cyber is one field where we have not kept pace with the emerging challenges. Whilst defensive measures and fire walls are finding their way, other capabilities need to be given the desired impetus. We have to balance our force modernisation requirements with the availability of funds. Financial probity with austerity in some peacetime activities are being ensured to facilitate procurement through the revenue route. Government is also being approached to make additional funds available for modernisation. SP’s: With the new Defence Minister having taken over what are the priority issues that the Army would like to bring to the notice of the Honourable Minister for early implementation? COAS: The Defence Minister fully understands our requirements and priorities and interacts with us on a regular basis. Our main issues of concern include procurement of new weapon systems and ammunition, capability and infrastructure development along our borders, continued financial support for modernisation and greater integration and reform in the Higher Defence Organisation. The issue of equivalence and status and some of the important anomalies in the 7th CPC have been projected by the Chairman COSC and the Defence Minister has assured full support for the issues raised. SP’s: Modernisation of small arms in the army is a long felt need. Have we made any progress in replacing the INSAS rifle, induction of new carbines, induction of fourth-generation ATGMs and equipping the infantry weapons with night sights? COAS: We are seized of the issue of modernisation of small arms in the Army especially for Infantry. We are working towards enhancing the fire power and night enablement of the Infantry. The cases for replacement of in-service INSAS rifles, induction of new Carbine and LMG are under process and are advancing in a fast tracked manner. Part of the delays in procurement of modern weapons for the infantry have been on quality control issues with our Ordnance factories, which have compelled us to consider import of these weapons. Government has accorded necessary approval for import, whilst other small arms for Arms and Services other than Infantry, we will continue to rely on in-house capabilities. A fire and forget ATGM with top attack day and night capability is also in advanced stages of procurement to enhance the antitank potential of infantry. To enhance the night fighting capabilities, a road map for night enablement of Indian Army is progressing as per Empowered Committee Directions of October 2013. Presently, case for procurement of night sights for all types of infantry weapon systems is under finalisation. SP’s: What is the status of long-postponed 1999 Field Artillery Rationalisation Plan (FARP), under which the Army had aimed to import, locally develop, and licence-produce around 3,000 x 155mm howitzers of various categories. Could we have a broad update on this issue which has been selectively given by the media from time to time. COAS: 155mm calibre guns have been made the standard gun system for Indian Artillery. Accordingly, ‘Artillery Profile’ was conceived and promulgated with emphasis on Mediumisation of Artillery. Based on our operational necessity, concerted effort has resulted in successfully contracting ultra-light howitzers from US Government and tracked (self propelled) artillery guns with L&T. To give impetus to indigenisation, major projects such as Dhanush gun system, designed and developed by OFB and Advance Towed Artillery Gun System (ATAGS) designed by DRDO in partnership with private industry are being pursued with a sense of urgency. It will be fair to mention that FARP is moving on track and we will in the next two to three years, have progressed with the proposals, in a satisfactory manner. SP’s: With the Line of Control (LC) continuing to be a live and explosive border, have we introduced any new surveillance and other devices which can detect movement of terrorists and serve as an advance warning for the army units deployed along the LC? What is our approach to prevent the infiltration of terrorists across the LC? COAS: The construction of Anti Infiltration Obstacle System (AIOS) was a landmark achievement in enhancing the capabilities of undertaking counter infiltration ops in J&K. The system over the years has matured and undergone modification and upgradation. Concomitant is the application of surveillance equipment including UAVs and quad/hexa copters which have been suitably networked and are instrumental in enhancing and strengthening real time response of units in conduct of CI/CT operations. Wearing off and damage to AIOS due to effects of inclement weather and heavy snow is a recurrent issue, which we deal with periodic resuscitation. Counter infiltration operations hinges on dynamic troop deployment with overlapping envelopes of surveillance and adequate reserves to cater for contingencies. The tiered system provides active filters which is enmeshing integrated surveillance. The intent at every filter is to eliminate the infiltrating terrorists, else act as an input for subsequent filters. SP’s: The threat in the Eastern theatre from China is increasing. When combined with the insurgency in the theatre the challenges become more critical. What is our approach to capability building to counter this phenomenon in the Eastern theatre? Has the expansion of Assam Rifles kept pace with the internal threat? COAS: Our analysis of force levels of PLA are under continuous review. Any conflict and application of military power will be contingent on many factors importantly the geo-political and geo-economic environment, diplomatic outreach and finally the politico-military aims. Counter-insurgency (CI) and counterterrorism (CT) situation in North East region has always been a factor in our operational planning. The dynamics of insurgency is being continuously monitored. Recent reports indicate presence of many outfits who have external support. A host of measures are already in place which involves multiple agencies to address multifarious issues of the restive region. It is highlighted that intense, intelligence based counter insurgency operations coupled with holistic approach to challenges in North East, has considerably stabilized the situation. The insurgency which earlier was seen as being ideologically driven has been superseded by extraneous considerations. The people at large want peace and are gradually distancing themselves from insurgent groups. The development with focus on Government’s ‘Act East’ policy is being viewed by most as an avenue for resources generation and employment. Interlocutors are involved in engaging various dissident groups to enable them to join the mainstream. Diplomatic and military parlays with Myanmar have increased to deal with and deny support to Indian Insurgent Groups (IIGs). Assam Rifles are mandated as a Border Guarding (BG) Force; they continue to work as facilitators by providing incidental security for infrastructure development, mineral exploration and development of communication arteries. Over the years, additional Army and Assam Rifles battalions have been deployed along the India-Myanmar border plugging gaps and better management of CI/CT grid. SP’s: Our ability to fight at the unit level in a net centric environment will depend on the Battle Management System being developed under the aegis of the Director General Information Systems. What is the progress in this field? COAS: Project Battle Field Management System was conceived in order to bring Network Centric Warfare capability down to unit/ sub units. The project envisages enhancing situational awareness for commanders from section and equivalent levels upto unit commanders by creating a common tactical picture that can be shared within the unit, higher HQ and with neighbouring units/ sub units through a secure, responsive and mobile communication media. Consortium of BEL with ROLTA and consortium of TATA Power SED with L&T, have been selected by MoD for development of prototypes under ‘Make’ category. The revised detailed project reports have been submitted by development agencies and are under evaluation. Directorate General of Information Systems is going through defining moments, to realise a field footprint of automation based on an incremental approach. The intention is to realise the net centricity vision through synergised implementation of all information system projects. SP’s: The signal communications at the platoon and company level in an infantry battalion continue to be unsatisfactory. What is planned in this respect and when can we expect the situation to be rectified? COAS: For infantry battalions deployed in CI/CT in J&K, the significant augmentation of operational capability has been achieved with the fielding of Mobile Cellular Communication System (MCCS). The increased use of light weight, digital radio sets in VHF and HF band also provides major capability enhancement. Also we need to understand that signal communications at platoon and company level in an infantry battalion during operations will be primarily on radio with line as the secondary means of communication. Latest communication technology is being leveraged to upgrade communication in combat zone. The improvement in connectivity in majority of forward localities has been carried out with extension of Optical Fibre Cable (OFC)/Jelly Filled Cable (JFC) suitably backed up by SATCOM terminals, especially for remote and inhospitable terrain. The case for equipping infantry soldier with state of the art Software Defined Radios (SDR) capable of operating at longer ranges and transmit data files is in progress. The aim is to significantly improve communication at unit level and below. It requires substantial indigenous development, especially on security related aspects of waveform and hardware development. The request for information for SDR has recently been floated. The full interview will be published in the SP’s Military Yearbook 2018.